Gives out the largest number of tickets in the State of Missouri. Have you been pulled over by Missouri Highway Patrol? Are you worried about insurance rate increases or points on your license? I can help. If you are pulled over by the Missouri Highway Patrol, you will receive a ticket. 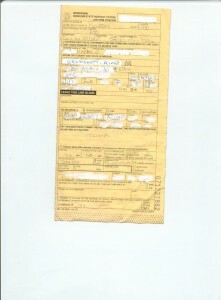 This ticket can be handwritten or a computer generated version (this is more recent). At the top, the ticket will identify the County in which you were stopped. The Fine Collection Center is the central clearinghouse for tickets issued by Missouri Highway Patrol. You will be able to send in your payment or pay online at the Fine Collection Center Website. If you pay the ticket, you will receive three points on your license and face possible insurance increases. You can avoid the points in some scenarios by taking the Driver Improvement Program (DIP). The link will give you the lists of counties where this is an option. The DIP allows you to take a driving school in lieu of points. You will still have to pay the fine and pay for the cost of the class. Many times, an attorney can negotiate a deal with the Prosecutor that will lower the points to a no-point speed or a Defective Equipment which is not reflected on your driving record. I work in several counties where I can negotiate a deal for you. A Missouri Highway Patrol ticket can be the most burdensome for many speeders. It may be in a location far from home and a troublesome process. The court fines for a Missouri Highway Patrol ticket will range from $150 to $300 depending on the jurisdiction. My fee is usually $150 but it depends on the County. 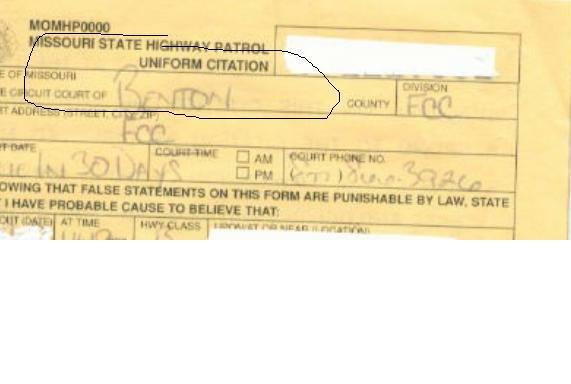 The image below is a copy of a MHP ticket with names changed to protect the innocent. When I speak or e-mail you, the most important piece of information I need is the County where the ticket was issued. This is found in the 2nd box from the top.